Among the gardener’s many friends are a variety of birds. Some species help pollinate crops while others wreak havoc on pest populations. Some help keep the rodent population in check while certain species eat the seeds off troublesome weeds. When planning an organic garden it’s definitely worth considering local bird species. 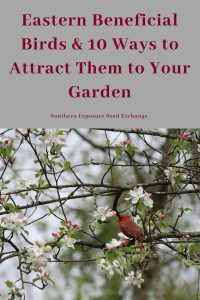 Implementing a few simple strategies to attract them to your garden can help you naturally improve your yields. These nocturnal hunters are excellent at keeping rodents from stealing your crops. The most common eastern species that will hunt in or near your garden include Barn Owls, Eastern Screech Owls, Barred Owls, and Great Horned Owls. Barn Owls, in particular, have seen population declines and would benefit from nest boxes. Only one species of hummingbird is commonly found in the eastern United States, the Ruby-throated Hummingbird. They are beautiful to see in the garden and help pollinate too! Often overlooked helpers in the garden are the seed-eating birds. Goldfinches are a common variety that’s easy to attract and they’ll lend you a hand by eating the seeds of many common weed species. While there are many species in the swallow family that eat insects Purple Martins and Barn Swallows are two species that can be commonly found frequenting backyard gardens. In the winter time cardinals will frequently be found at seed feeders however during the summer month they’re more than happy to eat pests in your garden. They’re very common on the east coast. Despite their sometimes bad reputation, Blue Jays can actually be helpful in the garden. They mostly feed on nuts and seeds but they’ll also eat caterpillars and other insects. Chickadees are common throughout much of the east coast and have no qualms about hanging out in your backyard. Depending on where you live you may see Boreal Chickadees, Black-capped Chickadees, or Carolina Chickadees with the second two being more likely to frequent populated areas. Chickadees are omnivores, making them easy to attract to your garden during the winter so they’ll munch on insects during the summer. These birds love to eat insects and could use some serious help. Eastern Bluebirds populations have declined due to competition with House Sparrows for nesting sites. If you’d like to attract them to your garden they’re happy to use nest boxes. There are several species of hawks that can be found in the eastern United States but you’ll most likely to see Cooper’s Hawks, Red-shouldered Hawks, Sharp-shinned Hawks, and Red-tailed Hawks near your garden and they can help keep rodents and other small mammals from overtaking your garden. The American Kestrel shares may of the same features of hawks but they are actually part of the falcon family. Research and put up species appropriate houses. Obviously, you’ll need a different sort of house for a chickadee than a barn owl but there’s more to it than that. 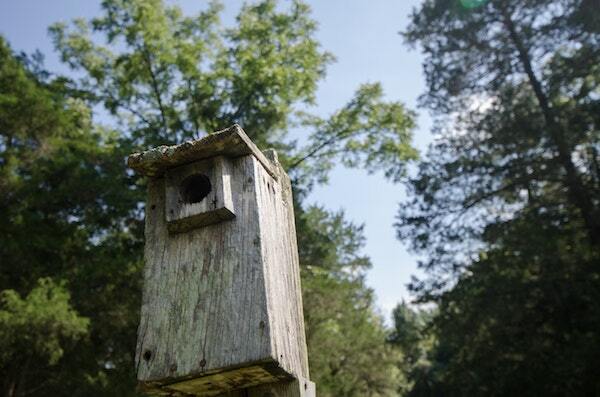 Some birds also have distinct territories and won’t nest in boxes too close to their neighbors. Research your favorite birds’ requirements and make houses to suit their needs. Feeders are an easy way to get birds to visit your garden. Many birds like chickadees will really benefit from seed feeders out during the winter but will lend you a hand with insects during the summer months as well. If you have bears in your area you may need to take feeders down during the summer months. Provide multi-level gardens. Birds like natural areas. Perfectly trimmed lawns and just low growing plants won’t cut it. Birds prefer places to land and hide. 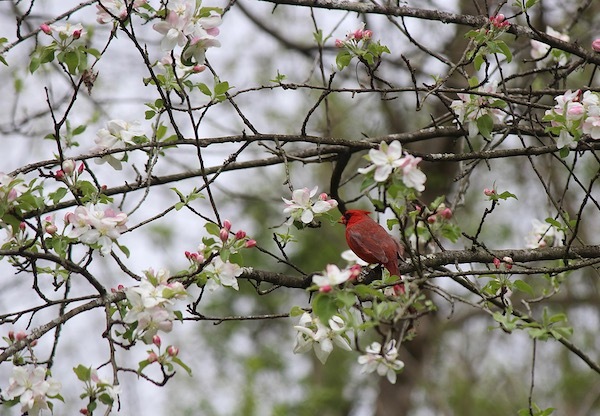 Adding a blend of taller and shorter plants, planting some things in dense groups, and adding perennial plants, shrubs, and trees will make birds feel more comfortable visiting your garden. In the same sense, keep nearby wooded areas natural. Leave standing dead wood for birds to nest in and feed on. Avoid heavy pruning and creating manicured looking woodlands. Leave standing dead material like corn or sunflower stalks during the winter. Birds that overwinter in your area will often find insects in them to feed on. Add a birdbath to your yard especially if you live in a dry area. While some birds will actually use it to bath many will use it to get a drink while they’re visiting your garden. Spay/neuter your cat. As lovable as cats are they can devastate a local songbird population. Having a pet is a wonderful thing but contributing to stray cats is horrible for wildlife. Avoid using rodenticides and insecticides as these will travel up the food change and harm or even kill birds. If you can leave a few sturdy, mature trees around. These are preferable perches for larger birds like hawks and owls. Make your windows visible. Hanging things in your windows or adding decals to them can save birds from unnecessary collisions. Of course, these are not the only birds that are helpful, there are tons of species! This list is just a few of the species common to the eastern United States that can be beneficial around gardens. Using these 10 tips can help you have a better garden while helping local wildlife. What do you do to attract birds? Did we miss anything?